Nintendo may have said we were playing with power on the NES, but we really will be when the 3DS comes out. The Nintendo 3DS is said to be a powerful machine that far outpaces the original DS's capabilities, and now we may have the tech specs to back it up. IGN reports that they've gotten their hands on the details of what's under the 3DS's hood. If the report is true, the 3DS uses two 266MHz ARM11 CPUs (the system's "brains"), whereas the DSi uses a 133MHz ARM9 and a 33MHz ARM7. 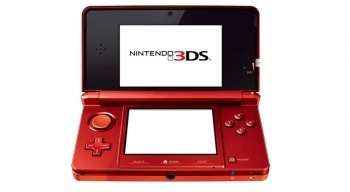 The 3DS will also use DMP's PICA-200 graphics processing unit running at 133MHz and will have 4MB of video memory. It'll quadruple the amount of RAM in the current DS with a total of 64MB, and will also provide a whopping 1.5GB of flash storage as compared to the current model's 256MB. So it's more powerful, but what does that mean? Eurogamer has done an in-depth analysis of the specs, their likelihood to be real, and what they mean compared to the other handheld electronics currently available. The 3DS's processors appear to put it close to the iPhone, which runs on a single 412MHz ARM11, but the 3DS can unleash dual cores on games without having to worry about running an operating system in the background. The 4MB of video RAM seems paltry, but the lack of details on exactly what it will be used for - textures or other properties - leaves its power level a mystery. The GPU appears to be running at a "surprisingly low" speed, as the PICA-200 can run faster than 133MHz, but speed doesn't beget it's ability to support self-shadowing, per-pixel lighting, procedural textures, and refraction mapping. These are the types of things that make the previously shown Resident Evil: Revelations demo look as good as it does according to Eurogamer. The 1.5GB of flash memory also raises a mystery as 3DS development kits are believed to have a 2GB chip. Eurogamer says: "Reserving a mammoth 512MB suggests that Nintendo has serious plans for the functionality of the unit over and above what we have seen so far." Nintendo seem to be the masters of surprises, so who knows what they have in store. Dimensional portal perhaps? The 3DS is rumored to be coming out anywhere from November to sometime in 2011, but we should find out the truth on September 29.